I would be interested but I think we need to get members to register their interest under this topic. If there is sufficient interest we take it up with one of the moderators or Teal who is apparently the site owner. (So thats 2 of us so far). As witnessed in OPP's thread, because SbSs tend to be of lighter construction and in view of the in vogue (somewhat silly) trend in producing faster and faster cartridges, cartridge choice can be problematic for these guns and particularly regarding recoil but not forgetting pattern quality. Therefore, would it be advantageous to include their ammunition in any sub forum? Can we count you as '3' ? Not so sure now. Hasn't even got off the ground yet and we're already quibbling. Just like the Pump Club, wouldn't this qualify as a sub forum to the Guns And Equipment forum? Brilliant 8 posts and an argument, proper pigeon watch! im in, would be interesting to see what others have got. 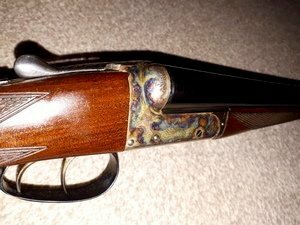 I'm in - Webley & Scott 700, built in 1974 and in mint condition. 1934 Winchester model 21 here. So I’m in. Therefore, would it be advantageous to include their ammunition in any sub forum? I would have thought that if we are asking to set up a "S x S Club" within the Guns & Equipment heading it should include cartridges for side by sides, seems a bit restrictive to exclude ammunition. For example if someone has a 2in. chambered 12 bore and wants to discuss his options for cartridges, to say shove off and discuss elsewhere. If you have an interest in S x S, to me it follows that you have an interest in safe / suitable loads. Victor sarasqueta 6ec. Sidelock, churchill rib, articulating trigger, 26" barrell. ? If we get one, it should hopefully include everything to do with a SBS, I thought he meant a sub part of the club, not included in it. My mistake! We will count him in then. Looks like 13 & counting ! If you allow me to include my Baikal and a s x s .410 hammer I'm in. Not sure who will make any rules, hopefully it will be the moderators and hope it welcomes all makes and gauges! Count me in. I use a 1964 AYA No. 3. It's 3 years older than me but looks a lot younger! Still has original case colour hardening and is a lightweight rough shooting gun.